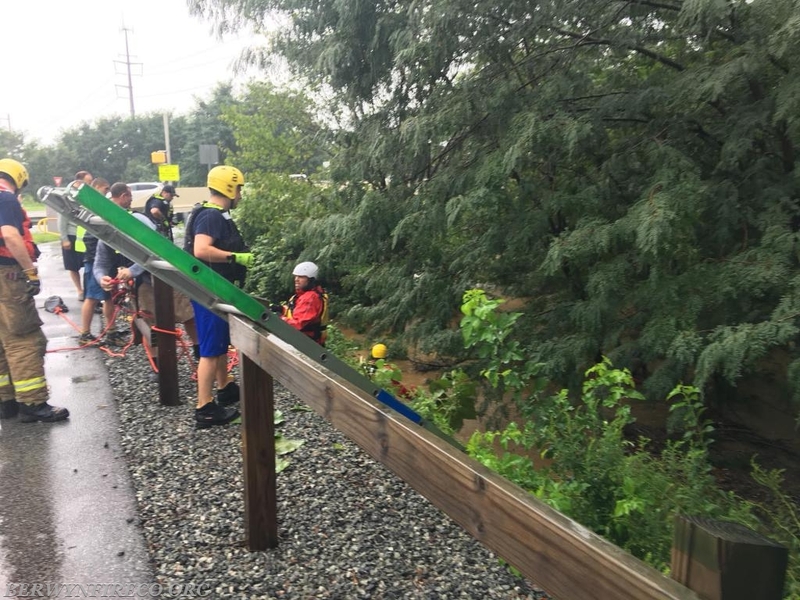 TREDYFFRIN TWP., PA - The Berwyn Fire Company was dispatched at 9:16 a.m. to the 900 block of Old Eagle School Road for a Water Rescue. 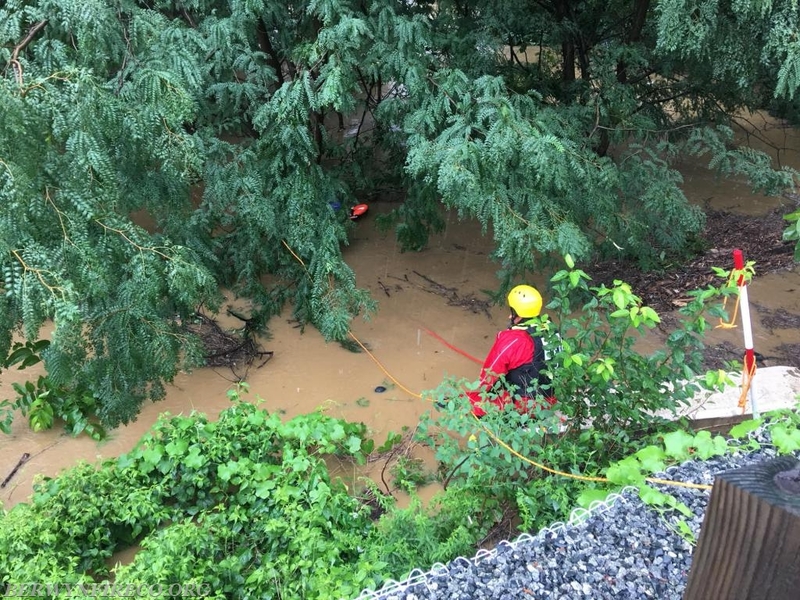 Initial 9-1-1 reports indicated that a person was swept into a storm water culvert and was unable to be located. Berwyn Engine 2-1 and Utility 2's crews had been operating at nearby flood related calls and arrived simultaneously at this incident within minutes of dispatch. 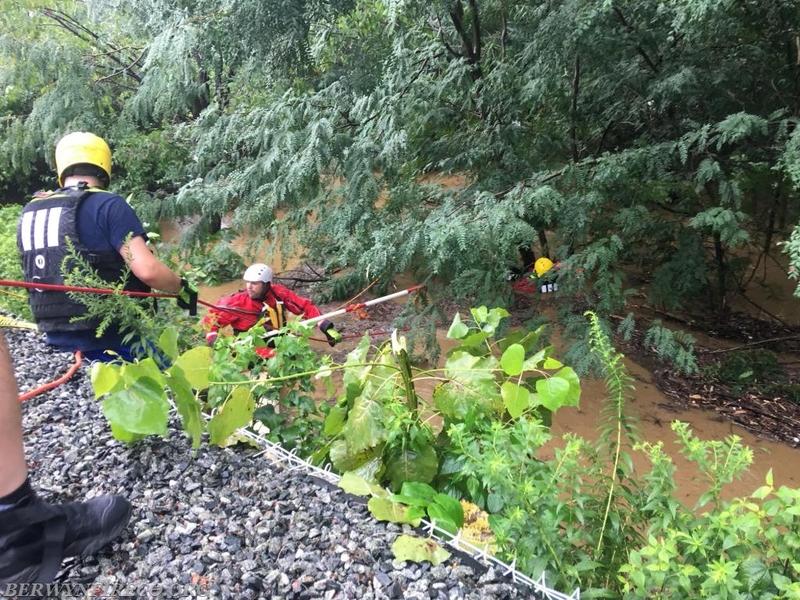 These crews were directed at the scene by Good Samaritans who had located the patient clinging to a tree surrounded by moving flood waters. 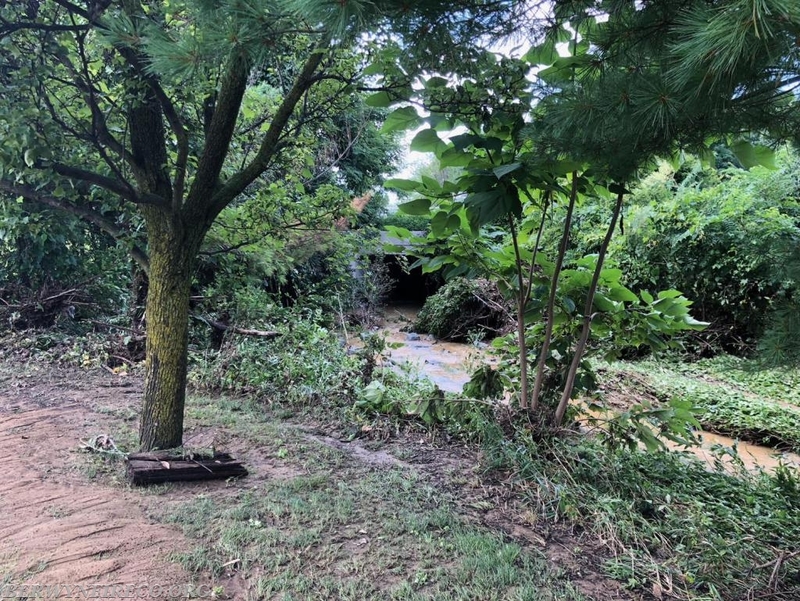 It was estimated that the victim had traveled almost 100 feet, submerged, under Devon Park Drive and the Chester Valley Trail while trapped in the storm water culvert. 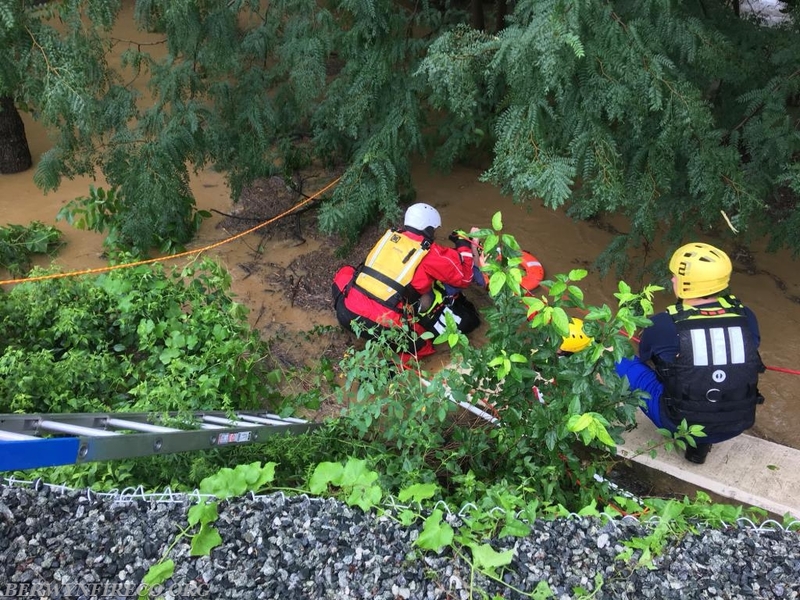 The crews on location recognized that victim was in imminent danger from being carried further downstream and drowning. Berwyn responders immediately prepared to make entry into the water to perform a rescue. Crews entered the water and were able to successfully swim to the victim and secure them to a life vest. Both the rescuer and victim were then hauled to the safety of the shore by other personnel on scene. The victim was transported to Paoli Hospital with non-life threatening injuries. 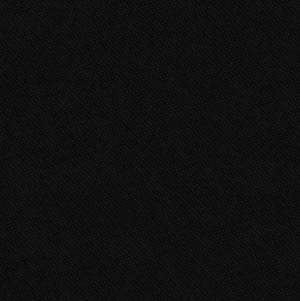 In this case, the victim was fortunate that bystanders witnessed their disappearance and calls for help. If not for alert civilians and the immediate action of responders, the outcome would have likely been different. As a reminder, just 6 inches of swift moving water is capable of knocking you off of your feet. 12 inches of moving water can sweep your vehicle off of the road. The impact of flood waters are often underestimated by motorists and pedestrians. Please use extra caution anytime you encounter fast moving water or areas where you cannot see the ground. Berwyn Rescue Technicians successfully reach the victim. Responders from the shore prepare a rope system which the rescue swimmers will use to reach and secure the victim. The victim is removed from the area utilizing a rope system and ground ladder. The moving flood water was estimated to be at least 6 feet in depth in this area. Berwyn Firefighters and Rescue Technicians extricating the victim. 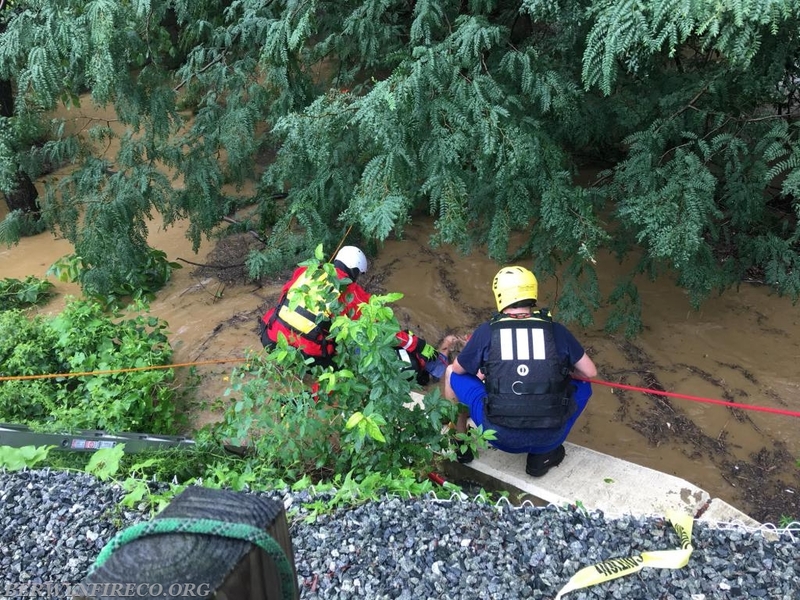 This image, taken after the waters subsided is where the patient entered the culvert.